We present a new approach to estimate precise long-term vertical land motion (VLM) based on double-differences of long tide gauge (TG) and short altimetry data. We identify and difference rates of pairs of highly correlated sea level records providing relative VLM estimates that are less dependent on record length and benefit from reduced uncertainty and mitigated biases (e.g. altimeter drift). This approach also overcomes the key limitation of previous techniques in that it is not geographically limited to semi-enclosed seas and can thus be applied to estimate VLM at TGs along any coast, provided data of sufficient quality are available. Using this approach, we have estimated VLM at a global set of 86 TGs with a median precision of 0.7 mm/year in a conventional reference frame. These estimates were compared to previous VLM estimates at TGs in the Baltic Sea and to estimates from co-located Global Positioning System (GPS) stations and Glacial Isostatic Adjustment (GIA) predictions. Differences with respect to the GPS and VLM estimates from previous studies resulted in a scatter of around 0.6 mm/year. Differences with respect to GIA predictions had a larger scatter in excess of 1 mm/year. 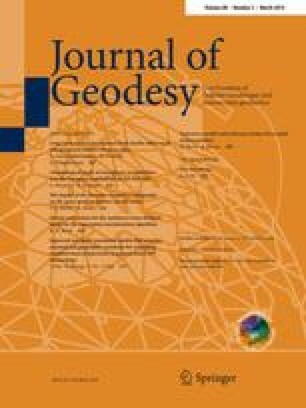 Until satellite altimetry records reach enough length to estimate precise VLM at each TG, this new approach constitutes a substantial advance in the geodetic monitoring of TGs with major applications in long-term sea level change and climate change studies. The online version of this article (doi: 10.1007/s00190-013-0677-5) contains supplementary material, which is available to authorized users. We fully acknowledge Xavier Collilieux, Matt King and Marta Marcos for their comments on the manuscript. We are grateful to Jake Griffiths for his support and comments on the NGS GPS velocities. We also thank four anonymous reviewers and the associate editor. Tide gauge data have been provided by the PSMSL. The altimeter products were produced by Ssalto/Duacs and distributed by AVISO with support from Centre National d’Etudes Spatiales (CNES). Sea surface pressure data used in this study have been provided by the ECMWF Data Server. ULR GPS velocities were provided by the SONEL data assembly center supported by the Institut National des Sciences de l’Univers (INSU/CNRS). The University of La Rochelle computing infrastructure was partly funded by the European Union (contract 31031-2008, European Regional Development Fund). The work presented in this article was supported by the French Research National Agency (ANR) through the CEP-2009 program (Project ‘Coastal Environmental Changes: Impact of sea LEvel rise’ (CECILE) under grant number ANR-09-CEP-001-01). Figures 2, 3 and 6 were produced with the Gnuplot software. Figures 4, 5 and 7 were produced with the Generic Mapping Tool (Wessel and Smith 1991).